Aided by the ongoing trend of LED adoption fueled by escalating demands of energy-efficient lighting solutions, the European LED lighting market, in recent years, has cropped up to be one of the world’s most lucrative investment grounds. The Light Emitting Diode (LED) technology, which utilizes semiconductors as well as electroluminescence to generate light, has been rapidly replacing conventional lighting technology in Europe attributed to LEDs’ ability to facilitate energy efficient solutions at a lower energy cost while still providing a light source that is significantly better in terms of quality. Moreover, the technologies considerably lowered environmental impact is one of the primary reasons driving industry growth. 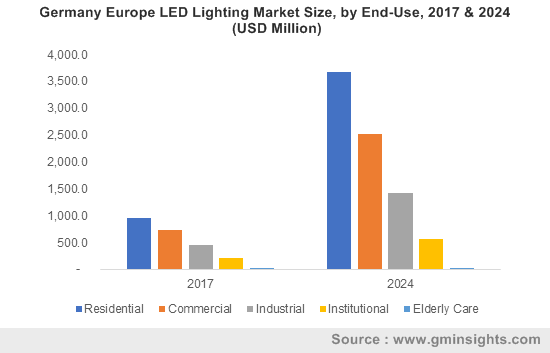 The European LED lighting industry market is also expected to depict an appreciable momentum owing to a number of government policies that aim to accomplish the European Union’s ambitious 2030 carbon emissions target. Incidentally, this target includes increasing the continent’s energy efficiency by at least 27% and reducing overall carbon emissions by at least 40% compared to the emission levels of 1990. Highly efficient LED lights that facilitate quality lighting with lower energy costs and fewer environmental impacts have historically come at significantly higher prices. However, over time, the overall costs of energy lamps have significantly declined owing to increased market demands, government regulations and technological innovations. According to a recent study by Danish Energy Agency, CLASP and Energy Piano, the price of LED lamps from high-quality suppliers in Europe are steadily declining and significantly improving in efficiency at a much quicker rate than previously predicted. The study found that the price points of LEDs presently are about 5 to 11 years ahead of the expert forecasts. In fact, LED lightings in Europe have become so affordable that some LEDs are expected to pay back for themselves in terms of energy cost savings in as little time as a year, that would further propel European LED lighting industry in the forthcoming years. The EU’s step to embrace and promote energy efficient lighting across a plethora of different industrial & commercial sectors by imposing a continent-wide ban on the sale of conventional non-directional halogen lamps on the 1st of September 2018 is projected to accelerate the adoption of LED lighting in the region, thereby boosting European LED lighting market size exponentially. The latest policy is expected to prompt consumers to gradually phase out their inefficient, old and obsolete halogen lamps and replace them with the latest LED lamps. According to a report by the European Commission, switching to LED lamps from an average halogen lamp would save consumers approximately €115 over the entire lifetime of the LED, which is at least 20 years. Moreover, the switch would be bringing annual energy savings to about 48.0 TWh of electricity and save over 15.2 million tons of CO2 emissions by 2025, thereby significantly driving the growth prospects of the European LED lighting market. The European LED lighting market is also fueled by new installations where consumers, spurred by greater energy cost savings, are replacing their conventional lighting solutions. Indeed, new installations, which accounted for a revenue share of approximately 65% of the industry share according to a 2017 estimate, would be witnessing sizable gains over 2018-2024, attributed to the EU’s ban on the distribution & sale of conventional one-directional halogen lamps. Smart city initiatives being adopted by the governments across the continent would also be responsible for influencing the regional LED lighting sales further. The European LED lighting industry is expected to traverse alongside a highly lucrative path, powered by the escalating incorporation of smart lighting solutions across a plethora of outdoor and indoor spaces. The rising rate at which LED lightings are being incorporated across commercial buildings & offices, hospitality centers and healthcare facilities throughout the continent will ensure that European LED lighting market would most certainly depict an appreciable growth rate in the years ahead. The application of LED lights in commercial applications is gaining considerable prominence due to the modern and stylish aesthetics the systems bring with them. In commercial setups such as banks & offices, LED lights facilitate an improved working environment for the employees. Moreover, the added advantage of enhanced energy cost savings offered by LED lights would be responsible for the system’s incorporation across the commercial sector, driving the growth of the European LED lighting industry. Attributed to the most prominent trends mentioned herewith, it is rather overt that the European LED lighting industry is well positioned to acquire sizable gains in the years to come. The projection is further supported by a report from Global Market Insights, Inc., claiming that the European LED lighting market size will exceed a valuation of more than $30 billion by 2024.